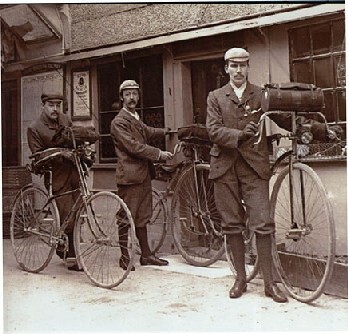 While the bicycle was known to instill a sort of instant camaraderie between its hundreds of thousands of admirers, further fraternizing could be had with one of the many cycling organizations or clubs that sprang up in the 1890s. The clubs became a way for men taking advantage of what was essentially an individualized activity to come together and bond over their shared affection for two-wheel travel. Some, like the Bicycle Touring Club, had singular agendas-- promoting touring in this case, while others served as lobbying groups for bicycling related interests. Whatever the reason for formation, clubs were popular, and in 1880, a good ten years before cycling was to become truly popular, the Northeast could boast of forty different cycling organizations. The biggest and most important cycling organization, the League of American Wheelmen, proved to be a tireless defender of bicyclist's rights. Founded in 1880 to "promote the general interests of bicycling, to ascertain, defend, and protect the rights of wheelmen , and to encourage and facilitate touring"(Smith, 12) the Wheelmen also published a cycling related magazine and organized a great many races. Also, while other clubs pitched themselves at the gilded fashionable set of cyclists, the wheelmen could be considered far less exclusive. The popularity of these organizations revolving around such an individualized endeavor says something interesting about American's need to belong to something. So, for all the talk of the bicycle as a "freedom machine" and great "social leveler" for the individual, people still held a spot in their hearts for the communal activities that the bicycle often provided.